In this tutorial, you will be introduced to filtering rows in SQL using the where clause. Filtering rows from a table with respect to a given condition or a set of conditions is a very common practice in data analysis. In SQL, you can do this using the where clause. In this tutorial, you will be using it for a number of different scenarios. You will use PostgreSQL as the RDBMS (Relational Database Management System), but the syntaxes do not vary much when it comes to using other database systems. You will start off by restoring a PostgreSQL database with a relevant table to work upon, and then you will execute several filter queries incorporating the where clause. Note: To follow along with the tutorial, you must be familiar with the basics of SQL and PostgreSQL. Following resources might be helpful if you are not familiar with them. Almost every RDBMS allows us to take a backup copy of a particular database and restore it. For this tutorial, you will use this backup file into a PostgreSQL database. In PostgreSQL, database backups as exported as .backup files. 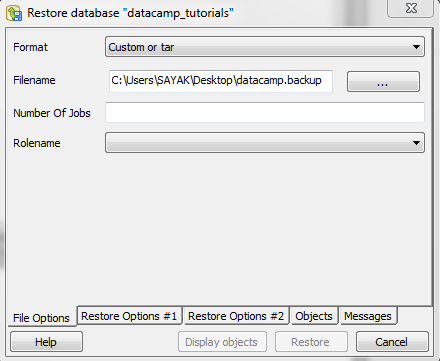 The given DB backup has a table within itself which would be used throughout this tutorial. To restore the backup, you will need to first create a database in PostgreSQL. So, open up the pgAdmin tool and create a new PostgreSQL database. Give it a name of your choice. Feel free to execute a select query on the table to see its contents. Let's now start filtering some records with the where clause. It's advised to use <> rather than != as per the SQL standards. The where clause always comes after from. In SQL, the strings quoted using single quotes. You get the records of a total of 145 countries which gained their independence after 1900. Take note of the comparator used here. The indep_yearcolumn is an integer in type. Hence, no quotes in the comparison. You get information about a total of 42 countries which are situated in the continent of Asia and gained their independence after 1900. Note that in the above query, you compared both textual and numerical values. As an exercise, you play with different combinations of AND and OR in the where clause. Note: When you are combining AND and OR, don't forget to enclose each of the condition within parentheses. Otherwise, SQL will get confused to determine of the precedence the evaluation of the conditions. With the following query, you get a total of 66 countries with condition as where (continent = 'Europe' and indep_year > 1900) or (continent = 'Asia' and indep_year > 1900). You get a total of 165 countries that are either situated in Asia continent or gained their independence after 1900 or having a surface area greater than 652090. Let's now convert the query into its AND variant where each of the conditions will be connected using AND. You will get a total of 9 countries in this case. 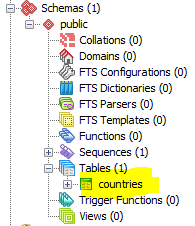 But the query select * from countries where indep_year = 1947 or 1912; is wrong. You should get the record of Russia.